Nearly twice as large as all the other Hawaiian Islands combined, the Big Island offers almost endless opportunities for play and relaxation. There's something here for everyone: visitors can marvel at stunning waterfalls tucked away in the tropical rainforests, head to Kona to sample local coffee or visit Volcanoes National Park. Of course, the many beautiful black and white-sand beaches are another main draw for most visitors, so here are the best beachfront hotels and resorts the island has to offer. Hidden away on the exclusive Kona-Kohala Coast, the Four Seasons Resort Hualalai offers traditional Hawaiian hospitality in the most luxurious way possible. 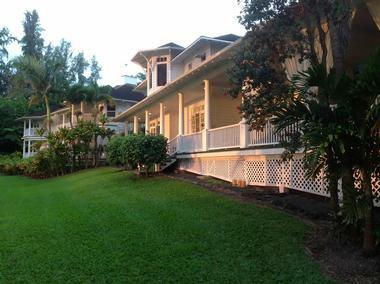 The elegant rooms, suites, and villas are housed in a series of bungalows furnished with native Hawaiian art and nature-inspired decor, and the bungalows are connected to one another by a series of landscaped paths that wind their way around the seven pools carved into the natural lava rock. Other on-site amenities include three restaurants, two lounges, a state-of-the-art fitness center, complimentary parking, tennis courts, an 18-hole golf course, and an open-air full-service spa. Sitting on 32 acres of lush grounds and tropical gardens, the Fairmont Orchid is a Four Diamond resort hotel located right on a stunning white sand beach. Amenities include a 10,000-square-foot pool right by the ocean, six on-site restaurants, a beach club, tennis courts, and a well-equipped fitness center. The hotel is also proud to offer a children's activity program that runs all year round. Complimentary high-speed internet access is offered to members of the Fairmont President's Club, and guests are also welcome to enjoy a treatment or two at the award-winning spa, which boasts private outdoor treatment rooms by either the ocean or a waterfall. Perched up on the bluffs of the sunny Kohala Coast, Hapuna Beach Prince Hotel offers classic Hawaiian luxury with a modern twist. The soft white sands of Hapuna Beach are only steps away, and the on-site hotel pool features cabanas, lounge chairs, and even pool ledge loungers. Another highlight of the resort is its private 12-hole golf course, which climbs from sea level to 700 feet and boasts spectacular panoramic views of the coastline. Parking is available free of charge, and guests are encouraged to rent paddleboards, kayaks, and other beach gear from The Beachery stand on Hapuna Beach. Sprawled over 62 acres on the Kohala Coast, the Hilton Waikoloa Village is an upscale resort with an extensive oceanfront playground that offers something for people of every age. Canal boats and air-conditioned trams are available to transport visitors around the property, making it easy to visit everything from the 25,000-square-foot spa to the beautiful swimming and snorkeling lagoon complete with sea turtles. Other highlights of the property include a dolphin encounter experience, two championship golf courses, eight tennis courts situated in a lush garden setting, and a museum walkway that displays approximately 1,800 pieces of art. Surrounded by trees, Aston Kona by the Sea is a laidback condominium resort that offers well-equipped one and two-bedroom suites. In-room amenities include full kitchens, laundry machines, and private balconies with either full or partial ocean views; guests are also free to use the freshwater pool, sundeck, hot tub, and barbecue areas. The hotel is situated on a rocky beach with a private sandy cove, and a larger sandy beach can be found only 2 miles away. 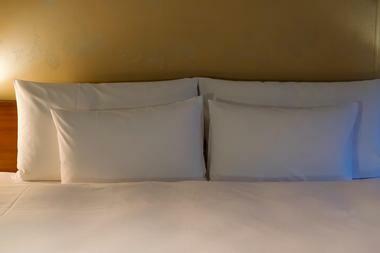 Free parking is available, and a daily resort fee includes in-room Wi-Fi, local calls, and in-room coffee and tea. Only 5 minutes away from historic Kailua-Kona Town, Castle Kona Bali Kai is proud to serve as a home away from home for its guests when they visit the Big Island. The one and two-bedroom oceanfront condos all come with well-equipped kitchens, free Wi-Fi, and private balconies or terraces; some units offer washing machines and views of the ocean as well. Communal amenities include a pool, a hot tub, a sundeck, and a barbecue area, and the hotel also offers a snack shack specializing in poke bowls and free lounge chairs on the beautiful rocky beach. 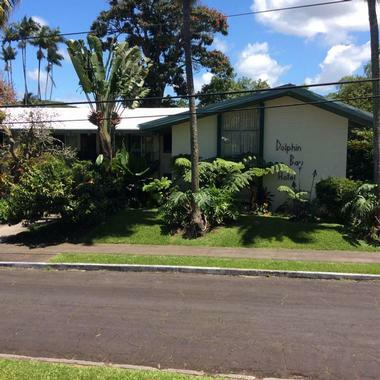 Conveniently located within easy walking distance of downtown Hilo, the Dolphin Bay Hotel is a cozy, intimate hotel that has been family owned and operated since it first opened in 1968. The hotel has 18 rooms, all of which come with full kitchens, cable television, and free Wi-Fi. 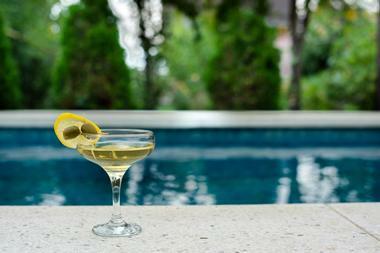 There is no on-site pool or restaurant, but plenty of excellent restaurants, bars, and beaches can be found nearby. A wide range of native plants and flowers can be found in the hotel garden, and the hotel staff are more than happy to help guests plan out their trips and book excursions and activities. 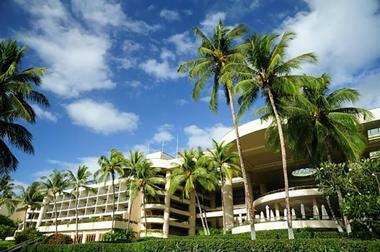 Offering stunning views of Hilo Bay and the Mauna Kea Volcano, the Grand Naniloa Hotel Hilo - a DoubleTree by Hilton boasts 70 acres of beautifully landscaped oceanfront property. All rooms and suites come with large-screen TVs, queen or king-sized beds, coffeemakers with local coffee, and kitchens or kitchenettes; some also have ocean views, luxurious soaker tubs, and wrap-around balconies. 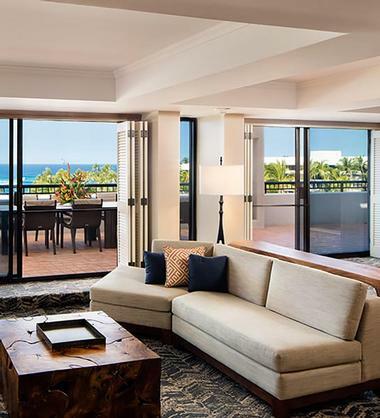 The lobby features rotating exhibits on various aspects of Hawaiian culture and history, and guests are also treated to complimentary parking, free Wi-Fi, and a daily complimentary round of golf on the resort's 9-hole golf course. Known for its dedication to preserving Hawaii's land and history, Mauna Lani Bay Hotel & Bungalows offers a selection of luxurious rooms and suites as well as tropically themed bungalows with private pools and hot tubs. The grounds boast historical fish ponds and two white sand beaches; on-site amenities include two championship golf courses, an open-air spa, a fitness center with a lap pool, and two excellent restaurants. The hotel is proud to offer bicycle rentals free of charge, and guests are also welcome to join in such complimentary activities as ukulele lessons, hula classes, and turtle feeding tours. 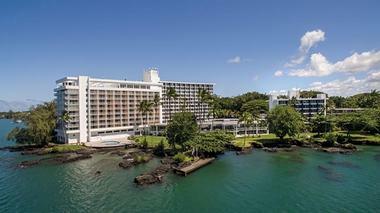 Formerly known as Sand & Seaside Hotels, the Hilo Seaside Hotel was established in 1956 and has been family owned and operated ever since. 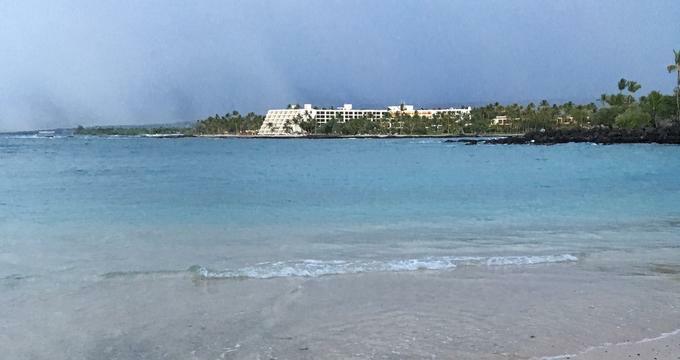 The hotel can be found on the east side of the island, and it offers easy access to attractions such as Rainbow Falls, the Rainforest Zoo, and Mount Mauna Kea. Free Wi-Fi and kitchenettes are offered in every room, and some rooms come with a complimentary breakfast. 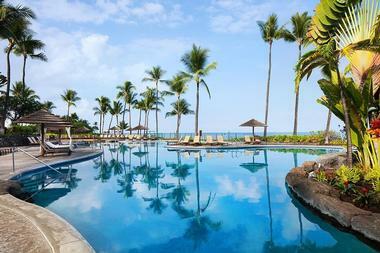 The outdoor pool is surrounded by lush tropical gardens and a koi pond, and traditional Hawaiian food can be purchased from the on-site restaurant. 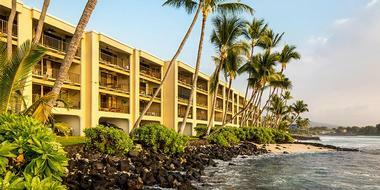 King Kamehameha's Kona Beach Hotel sits on the same location once inhabited by the famous Hawaiian King Kamehameha, and today the hotel prides itself on providing guests with a truly royal experience. The modern rooms are all decorated in a nature-inspired style and equipped with private balconies, free Wi-Fi, and flat-screen TVs, and on-site amenities include an inviting infinity pool, several restaurants, a fitness center, and 16 meeting rooms for anyone traveling on business. 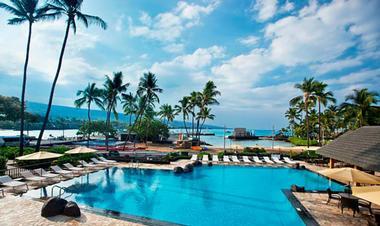 The hotel is located right on the peaceful white sands of Kamakahonu Beach, and it provides direct access to the Kailua Pier. 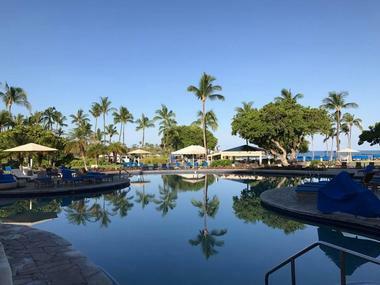 Only two 2 away from Waikoloa Beach, Kings' Land by Hilton Grand Vacations is an all-suite hotel set on landscaped grounds that are reminiscent of a lush Hawaiian plantation. The pool area is decorated with waterfalls and there are five pools and whirlpool tubs for guests to choose from, including a sandy bottom swimming pool and a sports pool. 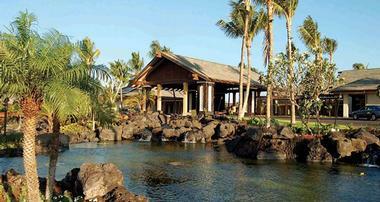 Guests are welcome to enjoy a meal at the resort's open-air bistro and lounge, but there is also a free shuttle service during the day for anyone who would like to visit the nearby Hilton Waikoloa Village. 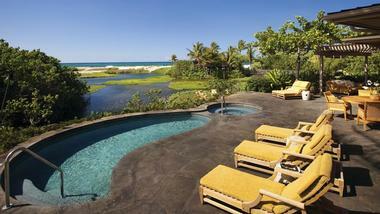 Tucked away on 21 acres of tropical gardens, Kona Coast Resort offers a relaxed atmosphere and direct beach access. The large pool area includes two pools, three hot tubs, and a sauna, and beach equipment can be rented by anyone who would prefer to relax in the sand. The spacious villas include either one or two bedrooms, and all are equipped with free Wi-Fi, kitchens, and laundry machines. Parking is free, and guests are also welcome to take advantage of the basketball, shuffleboard and sand volleyball courts, the 3-mile walking path, and the barbecue areas scattered throughout the grounds. 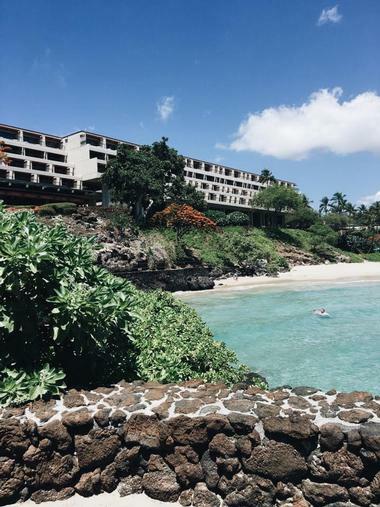 The Kona Seaside Hotel is owned by the same family that operates the Hilo Seaside Hotel, and its prime location on the Kona oceanfront means that guests have easy access to Kailua Bay and the pier as well as beautiful Kahaluu Beach Park. The waters at Kahaluu Beach Park offer some of the best snorkeling on the entire island, but guests can also stay at the hotel and swim in the beautiful on-site pool. Parking is available for a fee, and some rooms include views of the ocean and breakfast at a nearby restaurant. Situated just to the south of Kailua Village, Kona Tiki Hotel is the only hotel in Kona that can boast that all of its rooms face the ocean and have private oceanfront balconies or terraces. The hotel is perfectly suited to those who prefer to spend their time exploring the island or lounging on the beach; the tropically themed rooms come with free Wi-Fi and mini-fridges or kitchenettes, but rooms are not equipped with either TVs or phones. Parking and a daily continental breakfast are offered free of charge, and the hotel also offers an ocean view pool and a barbecue area. 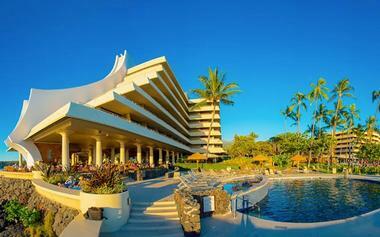 Opened in 1965, the five-star Mauna Kea Beach Hotel sits on 60 secluded acres and was the first resort to open in Hawaii. There are plenty of opportunities for guests to stay active without leaving the resort; not only does the hotel offer a well-equipped fitness center, but guests are also free to take advantage of the 18-hole championship golf course, the 11 seaside tennis courts, and the beautiful outdoor pool. After a busy day, guests can unwind in the full-service spa, at one of the four on-site restaurants, or on their private balcony. 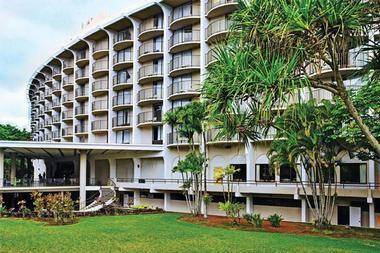 Often considered to be the best full-service hotel in Hilo, the Hilo Hawaiian Hotel is conveniently located 2 miles away from the Hilo International Airport and only a 3-minute walk from the lush Liliuokalani Gardens. 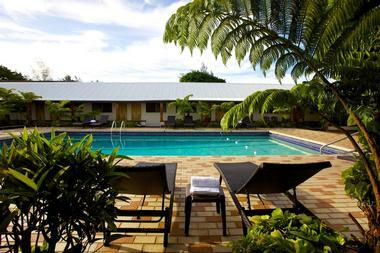 Rooms boast views of either the Pacific Ocean or the quaint Hilo Town, and guests are welcome to go for a swim in the freshwater outdoor pool or relax in the peaceful garden area. There are plenty of other on-site amenities as well, including a restaurant and cocktail lounge, a variety of shops, a meeting space, laundry facilities, and a 24-hour front desk. Spread out across three oceanfront buildings overlooking Kailua Bay, the Royal Kona Resort prides itself on its attentive service and its stunning views. Most rooms come with views of the ocean or the mountains, and some offer private balconies. There are also plenty of excellent amenities for guests to enjoy, including a private beach, an oceanfront pool, a saltwater swimming lagoon, a fitness center, and four tennis courts. Self-parking and Wi-Fi are available for a fee, and guests are more than welcome to relax in the on-site spa or enjoy a meal or a drink at one of the resort’s restaurants or bars. Resting on the iconic lava cliffs overlooking the ocean in Kona, the Sheraton Kona Resort & Spa at Keauhou Bay offers an excellent selection of well-appointed rooms and suites overlooking either the water, the mountains, or the beautifully landscaped grounds and gardens of the resort property. A major highlight of the property is the multi-level swimming pool, which features a lava tube waterslide, private cabanas, a number of whirlpools, and a sandy bottom pool area perfect for children. Parking, morning, yoga classes, and craft sessions are included in the resort fee, and live entertainment is offered every night at the on-site ocean view restaurant. 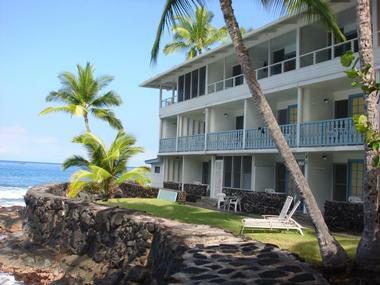 As a boutique eight-room bed and breakfast, The Palms Cliff House Inn offers a much more intimate experience than most other hotels in Hilo. All rooms come with private balconies and boast views of the stunning Pohakumanu Bay; other amenities include free Wi-Fi, beach towels, yoga mats, umbrellas, and a large selection of movies. A full breakfast is served each morning between 7:30am and 9:00am on the main terrace, and an in-room continental breakfast is available until 9:30am. For special events, guests can arrange a traditional Hawaiian high tea service for an additional fee. Right across the road from the beach at Oneo Bay, Uncle Billy's Kona Bay Hotel prides itself on its laidback atmosphere and its lack of resort fees. All rooms come with free Wi-Fi, cable tea, central air-conditioning, and private terraces; some include kitchenettes as well. The many shops, restaurants, and cultural attractions of Kailua-Kona village are only steps away from the hotel, and guests are encouraged to make use of the hotel's beautiful on-site pool and lounge chairs. A complimentary breakfast is offered every morning, and parking and laundry machines are available for a fee. 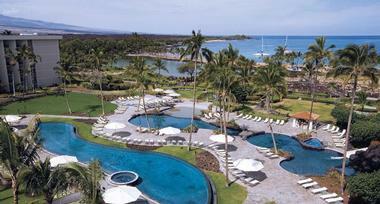 Set overlooking Anaeho'omalu Bay, Waikoloa Beach Marriott Resort & Spa features upscale rooms with balconies, an outdoor pool and hot tub, and a full-service spa. The hotel is also proud to offer the only large white sand beach in the Waikoloa resort area, and guests are encouraged to partake in the wide variety of watersports available here, go for a sunset sail, and explore the ancient Hawaiian fishponds in front of the beach. The on-site restaurant offers a breakfast buffet and Pacific Rim cuisine, and a number of other restaurants and shops can be found within easy walking distance. Located on the Big Island's beautiful west coast, Wyndham Kona Hawaiian Resort is an all-condo property that offers excellent views of Kahalu'u Bay. 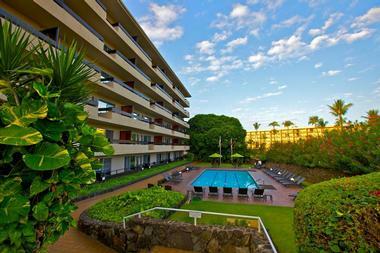 The spacious two-bedroom, two-bathroom condos are all furnished in a traditional Hawaiian style, and they offer full kitchens, in-room laundry machines, whirlpool tubs, private patios, and cable television. There are plenty of communal amenities for guests to enjoy as well, including two swimming pools, two hot tubs, a fitness center, and a barbecue area. Guests can also rent bicycles to explore the island, and a daily housekeeping service is offered for an additional fee. 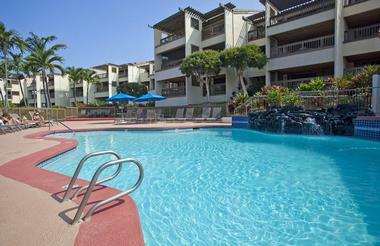 The Wyndham Mauna Loa Village boasts an excellent location right next to the Kona Country Club, and it offers the tranquility of a tropical oasis as well as convenient access to a wide range of shops, restaurants, golf courses, and other attractions. Guests can choose between one and two-bedroom condos, all of which come with full kitchens, separate living rooms with pull-out sofas, laundry machines, and private balconies. On-site amenities include six swimming pools, six hot tubs, eleven tennis courts, and a number of poolside barbecue areas. A children's activities program is available as well.